2O crystallizes from water solutions between 12.3 and 61.8 °C. The commercially available "sodium hydroxide" is often this monohydrate, and published data may refer to it instead of the anhydrous compound. As one of the simplest hydroxides, it is frequently utilized alongside neutral water and acidic hydrochloric acid to demonstrate the pH scale to chemistry students. Sodium hydroxide is used in many industries: in the manufacture of pulp and paper, textiles, drinking water, soaps and detergents, and as a drain cleaner. Worldwide production in 2004 was approximately 60 million tonnes, while demand was 51 million tonnes. Pure sodium hydroxide is a colorless crystalline solid that melts at 318 °C (604 °F) without decomposition, and with a boiling point of 1,388 °C (2,530 °F). It is highly soluble in water, with a lower solubility in polar solvents such as ethanol and methanol. NaOH is insoluble in ether and other non-polar solvents. Similar to the hydration of sulfuric acid, dissolution of solid sodium hydroxide in water is a highly exothermic reaction where a large amount of heat is liberated, posing a threat to safety through the possibility of splashing. The resulting solution is usually colorless and odorless. As with other alkaline solutions, it feels slippery with skin contact due to the process of saponification that occurs between NaOH and natural skin oils. Sodium hydroxide, NaOH, as a fluid solution, demonstrates a characteristic viscosity, 78 mPa·s that is much greater than water (1.0 mPa·s) and near that of olive oil (85 mPa·s) at room temperature. The viscosity of NaOH, as with any chemical, is inversely related to its service temperature; meaning viscosity decreases as temperature increases, and vice versa. The viscosity of sodium hydroxide plays a direct role in its application as well as its storage. 2O: from −28 °C (18.8%) to −24 °C (22.2%). 2O: from −24 °C (22.2%) to −17.7 (24.8%). 2O, α form: from −17.7 (24.8%) to +5.4 °C (32.5%). 2O: from +5.4 °C (32.5%) to +15.38 °C (38.8%) and then to +5.0 °C (45.7%). 2O: from +5.0 °C (45.7%) to +12.3 °C (51%). 2O: from +12.3 °C (51%) to 65.10 °C (69%) then to 62.63 °C (73.1%). Early reports refer to hydrates with n = 0.5 or n = 2/3, but later careful investigations failed to confirm their existence. 2O (β) can be crystallized from solutions of the proper composition, as listed above. However, solutions of NaOH can be easily supercooled by many degrees, which allows the formation of hydrates (including the metastable ones) from solutions with different concentrations. For example, when a solution of NaOH and water with 1:2 mole ratio (52.6% NaOH by mass) is cooled, the monohydrate normally starts to crystallize (at about 22 °C) before the dihydrate. However, the solution can easily be supercooled down to -15 °C, at which point it may quickly crystallize as the dihydrate. When heated, the solid dihydrate might melt directly into a solution at 13.35 °C; however, once the temperature exceeds 12.58 °C. it often decomposes into solid monohydrate and a liquid solution. Even the n = 3.5 hydrate is difficult to crystallize, because the solution supercools so much that other hydrates become more stable. A hot water solution containing 73.1% (mass) of NaOH is an eutectic that solidifies at about 62.63 °C as an intimate mix of anhydrous and monohydrate crystals. A second stable eutectic composition is 45.4% (mass) of NaOH, that solidifies at about 4.9 °C into a mixture of crystals of the dihydrate and of the 3.5-hydrate. When solutions with less than 18.4% NaOH are cooled, water ice crystallizes first, leaving the NaOH in solution. 2O and a liquid solution. The β form of the tetrahydrate is metastable, and often transforms spontaneously to the α form when cooled below −20 °C. Once initiated, the exothermic transformation is complete in a few minutes, with a 6.5% increase in volume of the solid. The β form can be crystallized from supercooled solutions at −26 °C, and melts partially at −1.83 °C. The "sodium hydroxide" of commerce is often the monohydrate (density 1.829 g/cm3). Physical data in technical literature may refer to this form, rather than the anhydrous compound. and three from water molecules. 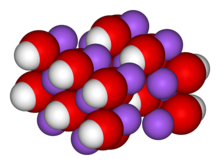 The hydrogen atoms of the hydroxyls form strong bonds with oxygen atoms within each O layer. Adjacent O layers are held together by hydrogen bonds between water molecules. A few transition metals, however, may react vigorously with sodium hydroxide. Unlike sodium hydroxide, the hydroxides of most transition metals are insoluble, and therefore sodium hydroxide can be used to precipitate transition metal hydroxides. The following colours are observed: blue-copper, green-iron(II), yellow/brown-iron(III). Zinc and lead salts dissolve in excess sodium hydroxide to give a clear solution of Na2ZnO2 or Na2PbO2. Aluminium hydroxide is used as a gelatinous flocculant to filter out particulate matter in water treatment. Aluminium hydroxide is prepared at the treatment plant from aluminium sulfate by reacting it with sodium hydroxide or bicarbonate. Sodium hydroxide can be used for the base-driven hydrolysis of esters (as in saponification), amides and alkyl halides. However, the limited solubility of sodium hydroxide in organic solvents means that the more soluble potassium hydroxide (KOH) is often preferred. Touching sodium hydroxide solution with the bare hands, while not recommended, produces a slippery feeling. This happens because oils on the skin such as sebum are converted to soap. Despite solubility in propylene glycol it is unlikely to replace water in saponificaction due to propylene glycol primary reaction with fat before reaction between sodium hydroxide and fat. Sodium hydroxide is industrially produced as a 50% solution by variations of the electrolytic chloralkali process. Chlorine gas is also produced in this process. Solid sodium hydroxide is obtained from this solution by the evaporation of water. Solid sodium hydroxide is most commonly sold as flakes, prills, and cast blocks. In 2004, world production was estimated at 60 million dry metric tonnes of sodium hydroxide, and demand was estimated at 51 million tonnes. In 1998, total world production was around 45 million tonnes. North America and Asia each contributed around 14 million tonnes, while Europe produced around 10 million tonnes. In the United States, the major producer of sodium hydroxide is the Dow Chemical Company, which has annual production around 3.7 million tonnes from sites at Freeport, Texas, and Plaquemine, Louisiana. Other major US producers include Oxychem, PPG, Olin, Pioneer Companies, Inc. (PIONA, which was purchased by Olin), and Formosa. All of these companies use the chloralkali process. Historically, sodium hydroxide was produced by treating sodium carbonate with calcium hydroxide in a metathesis reaction. (Sodium hydroxide is soluble while calcium carbonate is not.) This process was called causticizing. This process was superseded by the Solvay process in the late 19th century, which was in turn supplanted by the chloralkali process which we use today. Sodium hydroxide is also produced by combining pure sodium metal with water. The byproducts are hydrogen gas and heat, often resulting in a flame, making this a common demonstration of the reactivity of alkali metals in academic environments; however, it is not commercially viable, as the isolation of sodium metal is typically performed by reduction or electrolysis of sodium compounds including sodium hydroxide. For further information in historical production, see alkali manufacture. Sodium hydroxide is a popular strong base used in industry. Around 56% of sodium hydroxide produced is used by industry, 25% of which is used in the paper industry. Sodium hydroxide is also used in the manufacture of sodium salts and detergents, pH regulation, and organic synthesis. It is used in the Bayer process of aluminium production. In bulk, it is most often handled as an aqueous solution, since solutions are cheaper and easier to handle. Sodium hydroxide is used in many scenarios where it is desirable to increase the alkalinity of a mixture, or to neutralize acids. For example, in the petroleum industry, sodium hydroxide is used as an additive in drilling mud to increase alkalinity in bentonite mud systems, to increase the mud viscosity, and to neutralize any acid gas (such as hydrogen sulfide and carbon dioxide) which may be encountered in the geological formation as drilling progresses. Poor quality crude oil can be treated with sodium hydroxide to remove sulfurous impurities in a process known as caustic washing. As above, sodium hydroxide reacts with weak acids such as hydrogen sulfide and mercaptans to yield non-volatile sodium salts, which can be removed. The waste which is formed is toxic and difficult to deal with, and the process is banned in many countries because of this. In 2006, Trafigura used the process and then dumped the waste in Africa. Sodium hydroxide is also widely used in pulping of wood for making paper or regenerated fibers. Along with sodium sulfide, sodium hydroxide is a key component of the white liquor solution used to separate lignin from cellulose fibers in the kraft process. It also plays a key role in several later stages of the process of bleaching the brown pulp resulting from the pulping process. These stages include oxygen delignification, oxidative extraction, and simple extraction, all of which require a strong alkaline environment with a pH > 10.5 at the end of the stages. In a similar fashion, sodium hydroxide is used to digest tissues, as in a process that was used with farm animals at one time. This process involved placing a carcass into a sealed chamber, then adding a mixture of sodium hydroxide and water (which breaks the chemical bonds that keep the flesh intact). This eventually turns the body into a liquid with coffee-like appearance, and the only solid that remains are bone hulls, which could be crushed between one's fingertips. Sodium hydroxide is frequently used in the process of decomposing roadkill dumped in landfills by animal disposal contractors. Due to its low cost and availability, it has been used to dispose of corpses by criminals. Italian serial killer Leonarda Cianciulli used this chemical to turn dead bodies into soap. In Mexico, a man who worked for drug cartels admitted disposing of over 300 bodies with it. Sodium hydroxide is a dangerous chemical due to its ability to hydrolyze protein. If a dilute solution is spilled on the skin, burns may result if the area is not washed thoroughly and for several minutes with running water. Splashes in the eye can be more serious and can lead to blindness. Strong bases attack aluminium. Sodium hydroxide reacts with aluminium and water to release hydrogen gas. The aluminium takes the oxygen atom from sodium hydroxide, which in turn takes the oxygen atom from the water, and releases the two hydrogen atoms, The reaction thus produces hydrogen gas and sodium aluminate. In this reaction, sodium hydroxide acts as an agent to make the solution alkaline, which aluminium can dissolve in. This reaction can be useful in etching, removing anodizing, or converting a polished surface to a satin-like finish, but without further passivation such as anodizing or alodining the surface may become degraded, either under normal use or in severe atmospheric conditions. In the Bayer process, sodium hydroxide is used in the refining of alumina containing ores (bauxite) to produce alumina (aluminium oxide) which is the raw material used to produce aluminium metal via the electrolytic Hall-Héroult process. Since the alumina is amphoteric, it dissolves in the sodium hydroxide, leaving impurities less soluble at high pH such as iron oxides behind in the form of a highly alkaline red mud. Other amphoteric metals are zinc and lead which dissolve in concentrated sodium hydroxide solutions to give sodium zincate and sodium plumbate respectively. 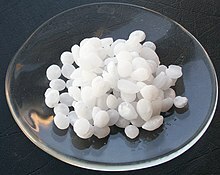 Sodium hydroxide is traditionally used in soap making (cold process soap, saponification). It was made in the nineteenth century for a hard surface rather than liquid product because it was easier to store and transport. For the manufacture of biodiesel, sodium hydroxide is used as a catalyst for the transesterification of methanol and triglycerides. This only works with anhydrous sodium hydroxide, because combined with water the fat would turn into soap, which would be tainted with methanol. NaOH is used more often than potassium hydroxide because it is cheaper and a smaller quantity is needed. Food uses of sodium hydroxide include washing or chemical peeling of fruits and vegetables, chocolate and cocoa processing, caramel coloring production, poultry scalding, soft drink processing, and thickening ice cream. Olives are often soaked in sodium hydroxide for softening; Pretzels and German lye rolls are glazed with a sodium hydroxide solution before baking to make them crisp. Owing to the difficulty in obtaining food grade sodium hydroxide in small quantities for home use, sodium carbonate is often used in place of sodium hydroxide. It is known as E number E524. German pretzels are poached in a boiling sodium carbonate solution or cold sodium hydroxide solution before baking, which contributes to their unique crust. Lye-water is an essential ingredient in the crust of the traditional baked Chinese moon cakes. Most yellow coloured Chinese noodles are made with lye-water but are commonly mistaken for containing egg. Sodium hydroxide is also the chemical that causes gelling of egg whites in the production of Century eggs. Some methods of preparing olives involve subjecting them to a lye-based brine. The Filipino dessert (kakanin) called kutsinta uses a small quantity of lye water to help give the rice flour batter a jelly like consistency. A similar process is also used in the kakanin known as pitsi-pitsi or pichi-pichi except that the mixture uses grated cassava instead of rice flour. The Norwegian dish known as lutefisk (from lutfisk, "lye fish"). Bagels are often boiled in a lye solution before baking, contributing to their shiny crust. Hominy is dried maize (corn) kernels reconstituted by soaking in lye-water. These expand considerably in size and may be further processed by frying to make corn nuts or by drying and grinding to make grits. Hominy is used to create Masa, a popular flour used in Mexican cuisine to make Corn tortillas and tamales. Nixtamal is similar, but uses calcium hydroxide instead of sodium hydroxide. Sodium hydroxide is frequently used as an industrial cleaning agent where it is often called "caustic". It is added to water, heated, and then used to clean process equipment, storage tanks, etc. It can dissolve grease, oils, fats and protein-based deposits. It is also used for cleaning waste discharge pipes under sinks and drains in domestic properties. Surfactants can be added to the sodium hydroxide solution in order to stabilize dissolved substances and thus prevent redeposition. A sodium hydroxide soak solution is used as a powerful degreaser on stainless steel and glass bakeware. It is also a common ingredient in oven cleaners. A common use of sodium hydroxide is in the production of parts washer detergents. Parts washer detergents based on sodium hydroxide are some of the most aggressive parts washer cleaning chemicals. The sodium hydroxide-based detergents include surfactants, rust inhibitors and defoamers. A parts washer heats water and the detergent in a closed cabinet and then sprays the heated sodium hydroxide and hot water at pressure against dirty parts for degreasing applications. Sodium hydroxide used in this manner replaced many solvent-based systems in the early 1990s when trichloroethane was outlawed by the Montreal Protocol. Water and sodium hydroxide detergent-based parts washers are considered to be an environmental improvement over the solvent-based cleaning methods. Hardware stores grade sodium hydroxide to be used as a type of drain cleaner. Sodium hydroxide is used in the home as a type of drain opener to unblock clogged drains, usually in the form of a dry crystal or as a thick liquid gel. The alkali dissolves greases to produce water soluble products. It also hydrolyzes the proteins such as those found in hair which may block water pipes. These reactions are sped by the heat generated when sodium hydroxide and the other chemical components of the cleaner dissolve in water. Such alkaline drain cleaners and their acidic versions are highly corrosive and should be handled with great caution. Sodium hydroxide is used in some relaxers to straighten hair. However, because of the high incidence and intensity of chemical burns, manufacturers of chemical relaxers use other alkaline chemicals in preparations available to average consumers. Sodium hydroxide relaxers are still available, but they are used mostly by professionals. 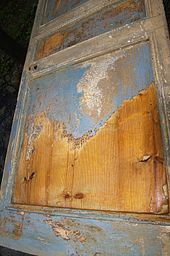 A solution of sodium hydroxide in water was traditionally used as the most common paint stripper on wooden objects. Its use has become less common, because it can damage the wood surface, raising the grain and staining the colour. Sodium hydroxide is sometimes used during water purification to raise the pH of water supplies. Increased pH makes the water less corrosive to plumbing and reduces the amount of lead, copper and other toxic metals that can dissolve into drinking water. Sodium hydroxide has been used for detection of carbon monoxide poisoning, with blood samples of such patients turning to a vermilion color upon the addition of a few drops of sodium hydroxide. Today, carbon monoxide poisoning can be detected by CO oximetry. Sodium hydroxide is used in some cement mix plasticisers. This helps homogenise cement mixes, preventing segregation of sands and cement, decreases the amount of water required in a mix and increases workability of the cement product, be it mortar, render or concrete. EMPA researchers are experimenting with concentrated sodium hydroxide (NaOH) as the thermal storage or seasonal reservoir medium for domestic space-heating. If water is added to solid or concentrated sodium hydroxide (NaOH), heat is released. The dilution is exothermic - chemical energy is released in the form of heat. Conversely, by applying heat energy into a dilute sodium hydroxide solution the water will evaporate so that the solution becomes more concentrated and thus stores the supplied heat as latent chemical energy. 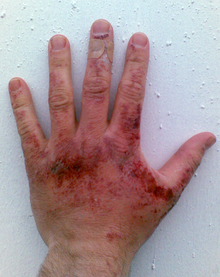 Chemical burns caused by sodium hydroxide solution photographed 44 hours after exposure. Like other corrosive acids and alkalis, drops of sodium hydroxide solutions can readily decompose proteins and lipids in living tissues via amide hydrolysis and ester hydrolysis, which consequently cause chemical burns and may induce permanent blindness upon contact with eyes. Solid alkali can also express its corrosive nature if there is water, such as water vapor. Thus, protective equipment, like rubber gloves, safety clothing and eye protection, should always be used when handling this chemical or its solutions. The standard first aid measures for alkali spills on the skin is, as for other corrosives, irrigation with large quantities of water. Washing is continued for at least ten to fifteen minutes. Lithium battery cells, if ingested, cause serious injuries, even if not crushed. The damage is caused, not by the contents of the battery, but by the electric current it creates, which causes sodium hydroxide to build up and burn through the oesophagus and into major blood vessels, which can cause fatal bleeding. Moreover, dissolution of sodium hydroxide is highly exothermic, and the resulting heat may cause heat burns or ignite flammables. It also produces heat when reacted with acids. Careful storage is needed when handling sodium hydroxide for use, especially bulk volumes. Following proper NaOH storage guidelines and maintaining worker/environment safety is always recommended given the chemical's burn hazard. Sodium hydroxide is often stored in bottles—as in laboratories, small-scale use—within intermediate bulk containers—medium volume containers for cargo handling and transport—or within large stationary storage tanks with volumes up to 100,000 gallons—as in manufacturing or waste water plants with extensive NaOH use. Common materials that are compatible with sodium hydroxide and often utilized for NaOH storage include: polyethylene (HDPE, usual, XLPE, less common), carbon steel, polyvinyl chloride (PVC), stainless steel, and fiberglass reinforced plastic (FRP, with a resistant liner). Sodium hydroxide was first prepared by soap makers. :p45 A procedure for making sodium hydroxide appeared as part of a recipe for making soap in an Arab book of the late 13th century: Al-mukhtara` fi funun min al-suna` (Inventions from the Various Industrial Arts), which was compiled by al-Muzaffar Yusuf ibn `Umar ibn `Ali ibn Rasul (d. 1295), a king of Yemen. The recipe called for passing water repeatedly through a mixture of alkali (Arabic: al-qily, where qily is ash from saltwort plants, which are rich in sodium ; hence alkali was impure sodium carbonate) and quicklime (calcium oxide, CaO), whereby a solution of sodium hydroxide was obtained. European soap makers also followed this recipe. When in 1791 the French chemist and surgeon Nicolas Leblanc (1742–1806) patented a process for mass-producing sodium carbonate, natural "soda ash" (impure sodium carbonate that was obtained from the ashes of plants that are rich in sodium):p36 was replaced by this artificial version. :p46 However, by the 20th century, the electrolysis of sodium chloride had become the primary method for producing sodium hydroxide. ^ a b c "Material Safety Datasheet" (PDF). certified-lye.com. ^ a b c "Material Safety Datasheet 2" (PDF). hillbrothers.com. Archived from the original (PDF) on 2012-08-03. Retrieved 2012-05-20. ^ a b "Sodium Hydroxide – Compound Summary". Retrieved June 12, 2012. ^ "Sortierte Liste: pKb-Werte, nach Ordnungszahl sortiert. – Das Periodensystem online". ^ a b Zumdahl, Steven S. (2009). Chemical Principles 6th Ed. Houghton Mifflin Company. p. A23. ISBN 978-0-618-94690-7. ^ a b c NIOSH Pocket Guide to Chemical Hazards. "#0565". National Institute for Occupational Safety and Health (NIOSH). ^ Michael Chambers. "ChemIDplus – 1310-73-2 – HEMHJVSKTPXQMS-UHFFFAOYSA-M – Sodium hydroxide [NF] – Similar structures search, synonyms, formulas, resource links, and other chemical information.". nih.gov. ^ "Sodium hydroxide". Immediately Dangerous to Life and Health Concentrations (IDLH). National Institute for Occupational Safety and Health (NIOSH). ^ "Examples of Common Laboratory Chemicals and their Hazard Class". ^ a b c d "Sodium Hydroxide Storage Tanks & Specifications". Protank. 2018-09-08. Retrieved 2018-11-21. ^ "Exothermic vs. Endothermic: Chemistry's Give and Take". Discovery Express. ^ Kirk-Othmer Encyclopedia of Chemical Technology, 5th edition, John Wiley & Sons. ^ Deming, Horace G. (1925). General Chemistry: An Elementary Survey Emphasizing Industrial Applications of Fundamental Principles (2nd ed.). New York: John Wiley & Sons, Inc. p. 452. ^ "Document 2 - CausticSodamanual2008.pdf" (PDF). 2013. Retrieved July 17, 2014. ^ Sample, Ian (16 September 2009). "Trafigura case: toxic slop left behind by caustic washing". The Guardian. Retrieved 2009-09-17. ^ "Trafigura knew of waste dangers". BBC Newsnight. 16 September 2009. Retrieved 2009-09-17. ^ Ayres, Chris (27 February 2010) Clean green finish that sends a loved one down the drain Times Online. Retrieved 2013-02-20. ^ Roach, Mary (2004). Stiff: The Curious Lives of Human Cadavers, New York: W.W. Norton & Company. ISBN 0-393-32482-6. ^ "Sodium:Getting rid of dirt – and murder victims". BBC News. 3 May 2014. ^ William Booth (January 27, 2009). "'Stewmaker' Stirs Horror in Mexico". Washington Post. ^ "ATSDR - Medical Management Guidelines (MMGs): Sodium Hydroxide". www.atsdr.cdc.gov. ^ Morfit, Campbell (1856). A treatise on chemistry applied to the manufacture of soap and candles. Parry and McMillan. ^ "Sodium Hydroxide". rsc.org. 2014. Retrieved November 9, 2014. ^ "Hominy without Lye". National Center for Home Food Preservation. ^ "Olives: Safe Methods for Home Pickling (application/pdf Object)" (PDF). ucanr.org. 2010. Retrieved January 22, 2012. ^ "Drinking Water Treatment - pH Adjustment". 2011. Retrieved June 23, 2016. ^ Brian Oram, PG (2014). "Drinking Water Issues Corrosive Water (Lead, Copper, Aluminum, Zinc and More)". Retrieved June 23, 2016. ^ Page 168 in: The Detection of poisons and strong drugs. Author: Wilhelm Autenrieth. Publisher: P. Blakiston's son & Company, 1909. ^ "Empa - 604 - Communication - NaOH-heat-storage". www.empa.ch. ^ Pubchem. "SODIUM HYDROXIDE | NaOH - PubChem". pubchem.ncbi.nlm.nih.gov. Retrieved 2016-09-04. ^ "aluminium_water_hydrogen.pdf (application/pdf Object)" (PDF). www1.eere.energy.gov. 2008. Archived from the original (PDF) on September 14, 2012. Retrieved January 15, 2013. ^ The English chemist and archaeologist Henry Ernest Stapleton (1878–1962) presented evidence that the Persian alchemist and physician Muhammad ibn Zakariya al-Razi (854–925) knew about sodium hydroxide. See: Henry Ernest Stapleton; R. F. Azo; M. Hid'yat Ḥusain (1927) "Chemistry in 'Iraq and Persia in the Tenth Century A.D.," Memoirs of the Asiatic Society of Bengal, 8 (6) : 317–418 ; see p. 322. ^ Stapleton, H. E. and Azo, R. F. (1905) "Alchemical equipment in the eleventh century, A.D.," Memoirs of the Asiatic Society of Bengal, 1 : 47–71 ; see footnote 5 on p. 53. From p. 53: "5. Sodium carbonate. Qily is the ashes of certain plants, e.g. Salsola and Salicornia … , which grow near the sea, or in salty places … "
^ Thomas F. O’Brien, Tilak V. Bommaraju, Fumio Hine, Handbook of Chlor-Alkali Technology, vol. 1 (Berlin, Germany: Springer Verlag, 2005), Chapter 2: History of the Chlor-Alkali Industry, p. 34. Heaton, A. (1996) An Introduction to Industrial Chemistry, 3rd edition, New York:Blackie. ISBN 0-7514-0272-9. Wikimedia Commons has media related to Sodium hydroxide. Look up sodium hydroxide in Wiktionary, the free dictionary.